A pass on both components is required for you to continue on in the program. The purpose of the oral examination is to provide students with the ability to apply their knowledge of case conceptualization, assessment, treatment, and ethics to a clinical case. Questions pertaining to these issues, including case descriptions, will be provided by members of the clinical comprehensive committee. During the one-hour examination, students will be examined by two members of the Graduate Department of Psychological Clinical Science. The committee may include any full or associate member of the department, but will exclude the Graduate Chair in the case of an appeal. Questions will fall into four broad areas: case conceptualization, assessment, clinical intervention, and ethical and diversity issues. Students will be asked specific questions based on 1) their personal clinical experience (e.g., as part of their practicum and other professional training) and 2) clinical descriptions provided to them during the examination. Exam content: The exam will include questions often proposed by the College of Psychologists of Ontario (CPO) Oral Examination for registration as a psychologist, as well as questions typically seen on interviews for practicum and internship. Students should have an available working knowledge of their assessment and treatment experience; they should be well versed in the CPO Standards of Professional Conduct, Canadian Psychological Association Practice Guidelines for Providers of Psychological Services, and the Canadian Code of Ethics for Psychologists. Students will be asked approximately 4-5 primary questions, with each answer spanning 15-20 minutes (including any follow-up questions by the committee). Timing of Exam: The exam will be held at UTSC and will be given to all students on the same date in November of the PhD2 year. Students will be assigned to one of two timeslots and will be notified via email of their assigned time and examining committee. Students are expected to attend the examination as scheduled. Only under extenuating circumstances (with appropriate documentation) will the Department consider scheduling a make-up examination. Evaluation: A student who successfully passes the oral examination will be able to (a) identify a theory of case conceptualization and accurately apply it to a case, (b) accurately identify the appropriate assessment measures and/or procedures, (c) provide an exhaustive list of potential diagnoses and identify the appropriate steps for making the differentials, (d) describe appropriate, evidence-based treatment options with associated therapeutic techniques (e) provide an exhaustive list of ethical issues raised by the case and identify the appropriate strategies for addressing these issues, with reference to relevant legislation and standards of practice, and (f) show insight in identifying personal, cultural, or diversity issues raised by a case, as well as how to address these in practice. The two-person committee will decide by consensus whether the student passes and students will receive a letter from the Graduate Chair notifying them of their results. The explicit purpose of the research comprehensive exam is to establish the student’s ability to independently extend their research program in line with the principles of the program. Students will demonstrate their ability to design a feasible and innovative research study by preparing a grant submission modeled after the Brain and Behavior Research Foundation’s NARSAD Young Investigator Grant (https://www.bbrfoundation.org/grants-prizes/narsad-young-investigator-grants). The proposed study cannot be the same as a dissertation study or proposal for funding to an agency based on their dissertation, but instead should be thought of as an extension of their dissertation. The grant also cannot be a complete replication, and thus be completely redundant, with an existing study. A replication and extension is acceptable assuming that the extension is clearly innovative. Ideally, the research grant proposal should include a study assuming that the student is now an independent researcher after the conclusion of their dissertation (which is the express goal of the clinical science program). In other words, what would be the next logical study in their research program. By writing a grant proposal, students have to demonstrate that they have the vision for an independent research program, including knowledge regarding study logistics, feasibility, recruitment, innovation and significance, and budget. Abstract (less than 500 words) – a summary of the research project written in layman’s terms. Applicant C.V. (~5 pages) – Canadian Common CV. Proposal (2 pages) – this proposal should project goals that will be accomplished within the grant period. The proposed study should be described in sufficient detail to elucidate hypothesis, impact/significance, central methodology, and planned analyses (including power analysis). Figures, tables, diagrams, et.al., must be included within the 2-page limit. Research Training/Career Plans (½ page) – brief description of present or recently completed research training, and applicant's future career plans. Budget (1 page/itemized table format) – a budget description specifying the amount requested with a brief justification. Requests must not exceed $35,000 per year. Adjudicators should take into account that the scope of the project must be limited by and made feasible given the funding amount. Timeline (1 page) – a timeline of the two-year proposed project including information on recruitment, training, data collection, data cleaning/analysis. Students should follow the NIH format guidelines that the Brain and Behavior Foundation uses: Arial, Helvetica, Palatino Linotype, or Georgia fonts with a font size of 11 or larger with minimum of ½ inch margins. This grant proposal should be worked on independently of the supervisor and will be due Oct 1 of the PhD2 year. This allows for the students to immediately start on their dissertation work after completing their dissertation proposal and comprehensive components. Timing the dissertation proposal and research grant close together will allow the student to more quickly be able to prepare the grant which is an extension of that work. Evaluation: Evaluation is based on a review by the Research Comprehensive Component Review Committee (comprised of three GD-PCS faculty members) who will adhere to CIHR review criteria applied at a level appropriate to PhD 2 students. 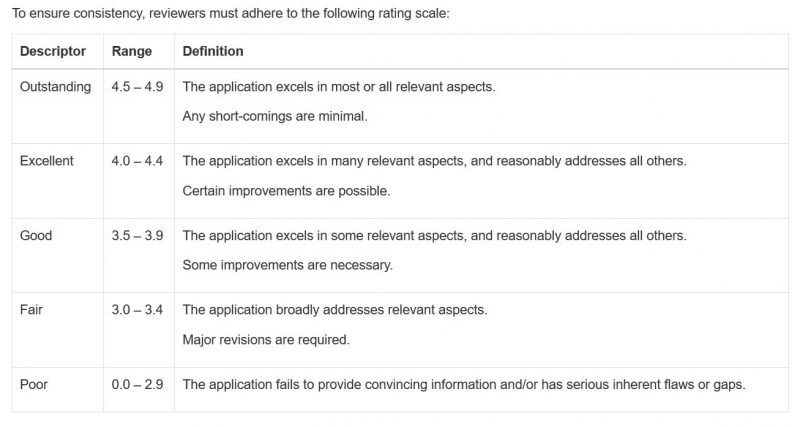 Any application rated 3.5 is considered fundable and would get a pass. Any application rated 3.0-3.4 would be asked for a major revision of their proposal. Any application rated below 3.0 would need a reformulation of the proposal and should consult with the Program Coordinator. Students will be provided with comments from the committee adjudication.